(0 Customer Reviews) | Write Review 12 issues per year Handmade is the word of the century. Whether you are a knitter, you crochet, sew, embroider, bake, garden or just dabble in a little bit of everything Handmade Living has it all. The magazine is packed with projects for beautifying your home, updating your wardrobe, gift giving and even eating. As well as being packed with projects you’ll also find interviews with everyone from Erika Knight to Monty Don, in-depth articles on craft and green living, gardening, beauty and so much more. You’ll also find at least one family project each month which you can make with your children. Whether you craft for yourself or your family and friends, Handmade Living has the project for you. We’ve got projects galore from all your favourite designers – an iCatching iPad cover from Miss Maker, Wee Wonderful’s Hillary Lang shares her Patchwork Penny project and we have a cosy cowl from Nicki Trench. If that, and the 38 other bright ideas aren’t enough, Lucie Summers talks fabric and we have all of your usual favourites – seasonal cookery, gardening and beauty. Handmade is the word of the century. 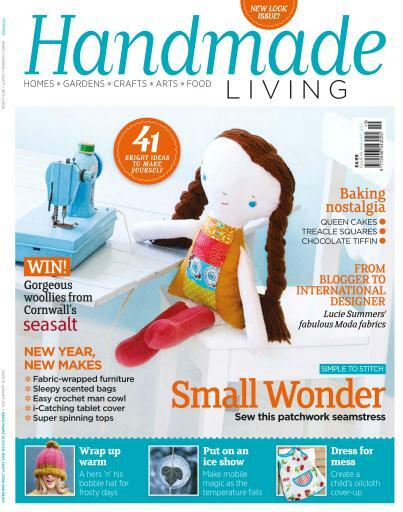 Whether you are a knitter, you crochet, sew, embroider, bake, garden or just dabble in a little bit of everything Handmade Living has it all. The magazine is packed with projects for beautifying your home, updating your wardrobe, gift giving and even eating. As well as being packed with projects you’ll also find interviews with everyone from Erika Knight to Monty Don, in-depth articles on craft and green living, gardening, beauty and so much more. You’ll also find at least one family project each month which you can make with your children. Whether you craft for yourself or your family and friends, Handmade Living has the project for you. You'll receive 12 issues during a 1 year Handmade Living magazine subscription. You'll receive 12 issues during a 1 year Handmade Living magazine print subscription.